Autofrica Car Rental is enjoying Ghana by car! We are Ghana’s online comparission auto rental company for short and long term. By using Autofrica Car Rentals we make sure you get the best deal with the most reliable car rental providers in Ghana. We operate in Accra, Kumasi, Takoradi, Tamale and many other places in Ghana. Our service are; airport pick, business trip or holiday trip across Ghana, we take care of your car rental, anywhere in Accra and Ghana. Daily, short or long term car rental in Ghana, we have it all. We welcome you to Autofrica Car Rental. 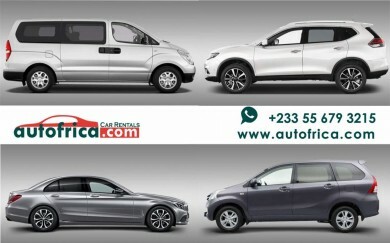 For maybe the best car rental deals in Ghana, a huge range of cars, Accra airport pickup/dropoff, business trips, pleasure, special deals & more, call Autofrica.com today.